WHEN CRITICS say that Savannah’s history is being sold one brick at a time, they’re usually being metaphorical. But that was literally the case last week, when an employee on the construction site of a massive, 1.7-acre new development on Indian Street near the waterfront was selling irreplaceable, centuries-old historic ballast stones on Facebook, after taking them home from the job site. The site is future home of 630 Indian Street, a seven-story apartment building housing 275 upscale units, built by Spandrel Development. Savannah Police say that Kevin Cox with Freese Johnson Construction took the bricks home in an effort to save them from the landfill. “Mr. Cox simply requested that he be allowed to take a load of them home rather than having all of them go to the landfill,” the police detective's report says, concluding that no action should be taken. However, screenshots that he and his wife Pam Cox posted to the Pooler Yard Sale Facebook page indicate that it was a money-making effort for the couple rather than an altruistic crusade for historic preservation. “These granite stones will make wonderful patios, walkways, mailboxes, flower bed boxes… and so much more,” Pam Cox wrote in the Facebook post. 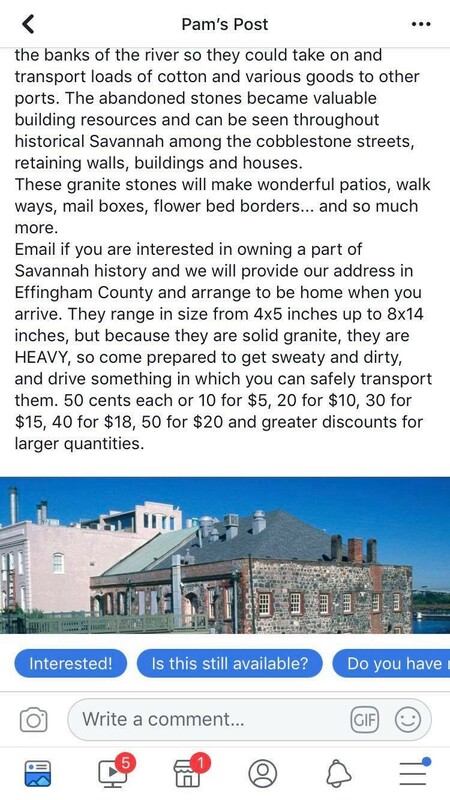 “Email if you are interested in owning a part of Savannah history and we will provide our address…. Come prepared to get sweaty and dirty, and drive something in which you can safely transport them,” Cox writes. “50 cents each or $10 for 5, $20 for 10, $30 for 15, $40 for 18, $50 for 20 and greater discounts for larger quantities,” she writes. The post has a photo of the Chart House restaurant on River Street as an example of the kind of stones the customers should expect to see. Cox told police he’d been given permission to take the ballast stones home by the Assistant Superintendent for the site. But a statement we received from Freese Johnson says the company didn’t and doesn’t condone the practice. “An employee of ours, not realizing the implications, apparently removed some stones from an on site driveway and attempted to sell them via Facebook,” Rodger Forseman, President of Freese Johnson, tells Connect. “He did not make this company, nor Spandrel Development, aware of his intent and obviously did not request permission,” Foresman tells us. “No material was sold and we are in the process of returning the material to the site…. 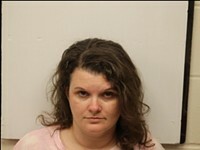 As this was one of our employees, of course, Freese Johnson is ultimately responsible. All we can ask is that this issue in no way reflects poorly on Spandrel Development or the project as a whole,” Foresman concludes. “Spandrel Development had no prior knowledge nor gave any type of consent to the selling of the historic ballast found on the site of 630 Indian Street,” says Emanuel D. Newman, co-founder of Spandrel Development. “The moment we became aware of the situation, we took the proper actions to end it immediately. 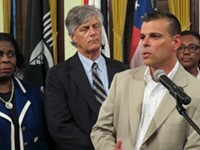 We understand and respect the history of downtown Savannah and do not take this lightly,” Newman tells Connect. "This city prides itself on its history and architecture, so I hope there will be an effort to adopt and implement policies and procedures that protect against such cannibalization and profit from thereon," Carey tells us. Because the site is on private property and not City of Savannah-owned land, the City’s options were limited, a City spokesperson says. Amazingly, there is still no archaeological ordinance for the City of Savannah, founded in 1733 and one of the nation’s oldest cities — and certainly a city with one of the most intact historic districts. The 630 Indian Street development is slated for completion by the fourth quarter of 2019. At 360,000 square feet, the project will be one of the largest buildings in downtown Savannah and “the first fully amenitized multi-family residential building since the 1960s,” according to the firm.